The best thing about top bubble games for Android is that they have the best graphics. The high graphics of the games make them look great on skin display, giving the user the urge to navigate more and the psych to play even further. The games have the lives feature, where a player has a given amount of lives which expire when they are defeated in the game. The good thing is that such games have friend system, which allow players to engage with friends and ask them for lives when theirs run out. They are easy to play, challenging and definitely interesting, which is why you will want to play them over and over again. We’ve sharing with you today one of our favorite bubble pop games. 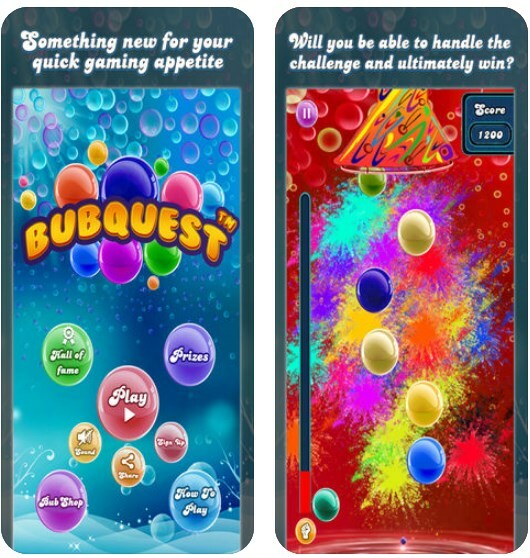 The name of the game is Bubquest, now available for both Android and iOS devices. Created with endless arcade gameplay, amazing graphics and smooth controls, this game will definitely become your newest addiction. Plus, it’s suitable for all ages. The main goal in this ball popper is simple and straightforward: tap on your screen to pop the bubbles as fast as you can before they reach the whirlpool. Be quick and focus as you smash all the falling bubbles and be careful – the more bubbles fall down in the whirlpool, the more your lifebar will lose life. Control your lifebar by using your best tapping skills and use different special bubbles. There are different types of bubbles integrated in this game, each one of them created with special powers. Pop the super bubble and let it save your day, dodge the bomb to avoid reducing lifebar by 20%, escape from the nuclear bubble or it will be game over for you, or burst the heart to see your lifebar go up. The difficulties will increase as you progress, so try harder if you want to win higher points and win cool prizes. Play against players from all around the world, secure your place in the top 3 and take part in a real prize-winning competition. Enjoy hours of fun by downloading Bubquest from the App Store or from Google Play – it’s totally free.